If you’re a Vanderpump Rules fan, you’re well-versed in the WeHo life. If you’re not, well it’s the LGBTQ capital of LA, where the pride parade happens. The area is rich with high end shops, restaurants and bars (and rich people! ), and is close to Beverly Hills, Hollywood and all the entertainment studios. My favorite part of WeHo is of course Melrose Ave. where there are so many murals! You really can’t go wrong hanging out here. 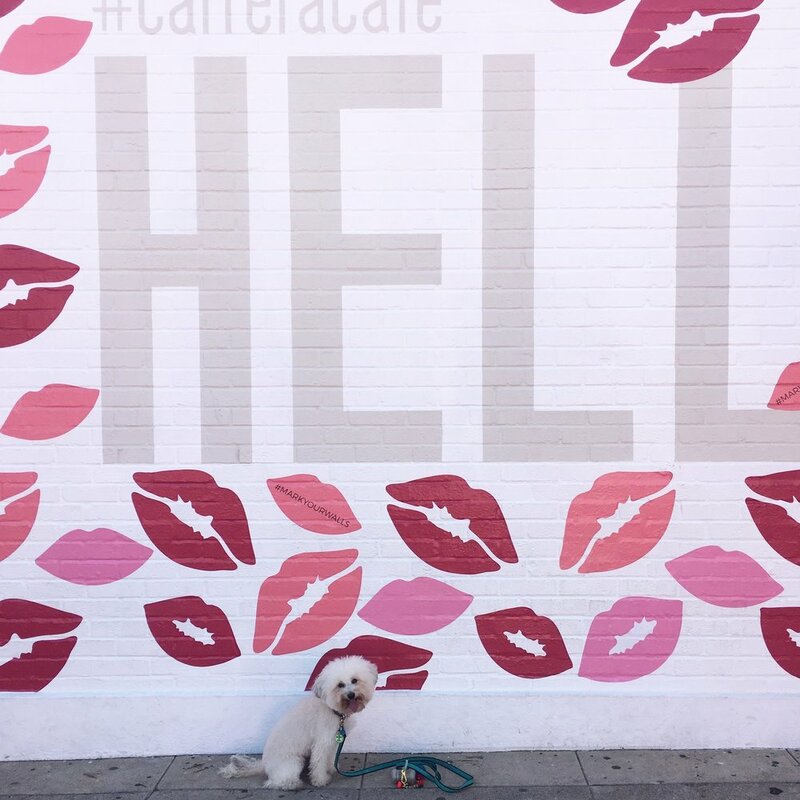 Scroll below to see all the best dog-friendly spots in West Hollywood! At the bottom there’s a Google Map so you can go on your own wall crawl. SHOP TIL YOU DROP! - Melrose is known for their vintage shops. A personal favorite of mine is Slow, but I highly recommend just walking up and down the street and going in what calls to you! Especially because then you can..
WALL CRAWL! - some of the most popular murals in the world are on this street. The Paul Smith Pink wall normally has a crowd of people ready to pose. You can get a lot of bang for your buck on this street but it’s pretty long, so bring a water dish for your pup! Use the Google Map link below to plan your route. Carrera Cafe - you can kill two instagrammable birds with one stone here, as they have a latte machine that prints a picture onto the foam art & it’s right across the street from the Paul Smith Pink Wall! They also have a mural of their own, but it changes pretty frequently and often looks more like an ad than a mural. Coffee for Sasquatch - this coffee shop has one of my favorite walls in the city, a big sasquatch made out of shrubbery! Their coffee selection is really unique as well, my personal favorite is the honey lavender latte. Wirsthaus - if you’re in the mood for a more adult beverage, I love taking Watson to Wirsthaus. There’s enough outdoor space that you don’t feel too cramped and the beer selection is excellent! Republique - oh em gee best brunch EVER (I hear the dinner is great as well)! I love this place, from the modern French decor to the coffee window. It gets packed after 9am though so make sure to get there early and snag a spot on the dog-friendly patio! 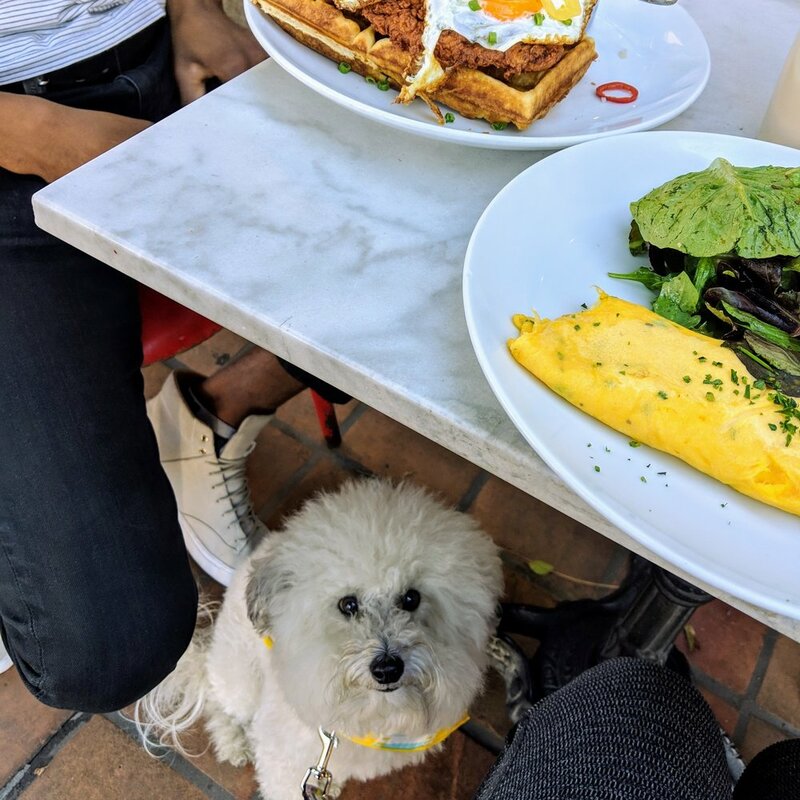 Estrella - another great brunch & dinner spot in the area, with a beautiful outdoor patio to hang with your pup. Last time I was at Estrella there was a model / fashion party happening inside which was pretty wild. They also give really heavy wine pours! Shake Shack - many will argue with me about this choice, but I will drive my Westside booty all the way to WeHo just for Shake Shack! To me it’s the perfect hangover food, and they offer food for the pups too. Pro tip: I think the burgers taste better if you ask for a dry bun - they butter their buns before toasting and I’m just not fan of grease on grease! I highly recommend staying at the Palihouse in West Hollywood! They’re dog friendly and have the cutest restaurant and lounge area. You’re also right within walking distance to a lot of great places. Check out this post with more info on the hotel. Use this map to go on a wall crawl of your own! You can add this mural to your Google Maps app on your phone. All of the murals are in dark pink, shops are in purple, places to drink are in teal and place to eat are in blue.